It’s that time of year. Summer vacation and family travels. This past school year was the first year that we did a co-op. My oldest has finished his last year of “preschool”. That means…..we are officially on summer vacation! (at least in our family. 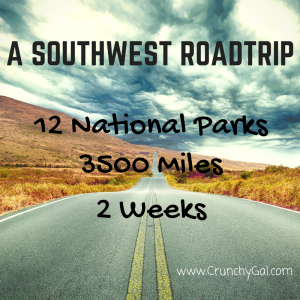 ;)) Since we hit some bumps in the road last year, this year’s National Park journey/see all the states will be a Southwest Road Trip again. We are planning a revisit of some of our spots from last year, plus some places we are super excited to explore for the very first time! Here are the highlights for this year’s Southwest Road Trip. This is currently our game plan, and I cannot wait to see how it plays out! As we visit the various parks, I’ll come back and blog/journal about the hikes we actually did and what we liked and enjoyed about the different parks and cities. My kids are in full countdown mode and are so crazy excited! It’s all they are talking about right now. <3 I love that we are raising little adventurers. Our plan is to get up while it is still dark and drive from Texas to Carlsbad, catching breakfast along the way. We are planning to do the Natural Entrance Tour (1.25 miles – about an hour), and the Big Room self-guiding tour (1.25 miles – about an hour) since our kids aren’t all old enough to participate in some of the more adventurous hiking that is available here. My kids are most looking forward to watching the Bats exit the cave at sunset. We are spending the night in Carlsbad, and then heading to Guadalupe Peak. The McKittrick Canyon hike here sounds amazing, but way too overwhelming for my littles. I think we can hike out to Pratt Cabin but that hike alone is 4.8 miles round trip just to that spot so we will see how we feel in the morning. As we drive into the park, we will also plan to hike the easy 2.3 mile loop trail to Smith and Manzanita Springs. The NPS says: “Time Estimate: 1.5 hours Difficulty: Easy – Moderate. The Smith Springs Loop is paved from Frijole Ranch to Manzanita Spring. It then ascends along a maintained trail to the heavily vegetated Smith Spring. The trail offers dramatic views of the surrounding mountains, foothills, and desert landscape.” After lunch, probably early afternoon, we will head out to Alamogordo for the night (a nearly 3 hour drive). We are so excited to take the kids to White Sands and go sledding and exploring here with them for the morning hours. On the NPS website, they mention that there are Junior Ranger Adventure Packs that you can loan out. These sound amazing. “Each Junior Ranger Adventure Pack contains a backpack that has a pair of binoculars, animal tracks fold-out guide, compass, flashlight, adventure tool, Desert Survival Guide, New Mexico Birds fold-out guide, Desert Life book, Easy Field Guide –Birds, Easy Field Guide –Insects, Easy Field Guide –Mammals, and an Easy Field Guide –Snakes.” My kids are so looking forward to this day! Our afternoon will be marked by a long 5 hour drive over to Tuscon. This morning will be started by a visit to the Arizona-Senora Museum before it gets too hot. The museum website recommends allowing about 2 hours to see everything. After that we will drive the scenic trail at the Saguaro Park so the kids can see all the catci, get their book stamps, and do the Jr. Ranger program which has a discovery pack you can check out and do! Then we get to drive to Arizona and see one of my best friends and stay the night with them. I am over-the-moon excited to see her and her family! After hopefully what will be a fun breakfast with my buddy and her family, we will head up to Sedona for the afternoon. Depending on what time we leave I’d like to make a quick stop through Montezuma Castle. There is a quick 1/3-mile loop trail. If we we were somehow doing great on time we could head to Tuzigoot which also has a 1/3-mile loop trail. These aren’t make or break stops, so we will see how the morning is treating us. Then we will head on to Sedona. I’d love to hike the 1.5 mile trail at Cathedral Rock if it is not too hot by the time we get there. I doubt we will feel like hiking all of Bell Rock trail (over 5 miles), but it might be neat just to start out and do a little walking on the trail. I’d really also love to see the views again at Chapel of the Holy Cross. We have been told we MUST do Slide Rock Park. So clearly we have way, way too much booked for this day. Not sure what we will actually pick. On the way into town we will hit up Lake Mead (which is a National Park, who knew?!) and Hoover Dam. Day 7 will be a full fun day in Vegas. 8:00 PM to 8:10 PM – Outside the Mirage hotel-casino located on the Strip between Flamingo and Spring Mountain Road. The Zip Line through downtown!! https://www.vegastheapp.com seems to have discounted tickets. As we drive up from Las Vegas we will visit Kolob Canyons Rd. Kolob Canyons Road is off of Interstate 15, and is a 5 mile drive with amazing views of the red rocks and Zion. Not sure if Kolob Terrace is worthy of the time, but it’s a possibility, “Take the signed turn-off located on SR-9 in the small town of Virgin. Coming from Zion’s south entrance, leave the park and drive on SR-9 to Virgin. On the right, just after entering the town of Virgin you will see a road sign for the Kolob Terrace Road. Turn there and follow the scenic drive up the hill. 20 miles, primitive road area out to Lava Point one way. Is highest point of Zion.” If there is still time in the day we will take in the Tunnel/Canyon Overlook Trail inside of the park of Zion. We have a full day at Zion but not sure what we will want to see. Obviously, we will take the bus along Zion Canyon Scenic Drive and seems like the best hike for our stage of life will be the Riverside walk trail. Sooooo much I want to do and see here, but we will be limited with all the littles. We have a bit of a drive to get up here from Zion, so it will only leave time for us to do the drive through and see the main highlighted viewpoints: Sunset, Sunrise, Inspiration, Bryce. And then we will hike the Navajo/Queens Garden Loop before calling it a day. We will only be visiting the South Rim. I’m not sure of what we will all accomplish here in that window, but since I’ve been here countless times and my husband has visited here before, we are mostly just excited to take it all in again, and be sharing it with our kiddos. As we leave from the Grand Canyon, we will head south via a visit to Wupataki and Sunset Crater. The kids are super excited to see volcano ruins. Since we have been here before we have tried to tell the kids it is not like what they see in the movies. I think they will still be fascinated and have fun out on the Lava Trail. This is a pretty low-key and flexible day. This day will be hectic since we will attempt to check out two national parks that could easily both consume a full day. Since it seems like there might not be tons for us to do in Petrified Forest, I am imaging just a drive though and maybe a tiny bit of sight-seeing and then onto Canyon de Chelly. And now we start our grand trek home. It makes me sad to think about this trip ending, and it hasn’t even started yet. Hopefully, there will be some fun things to see as we head home. I would love to visit the Hubbell Trading Post, and even take a ride on the Sandia peak tram!!! Which of these parks have you visited? Any tips to share or places that are must-sees? Which trails do you love to hike? I’d love for you to leave any and all insight! !